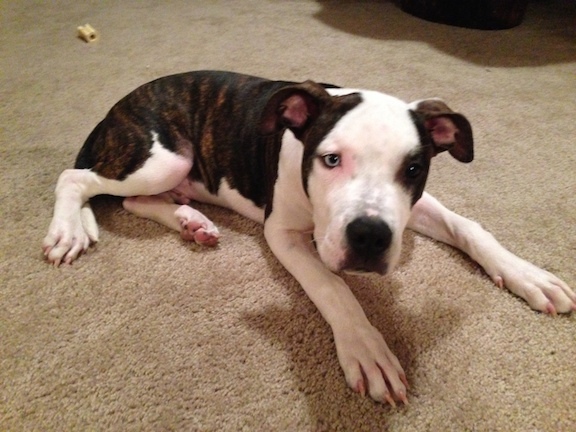 This is Blu, a mixed Bulldog puppy who was adopted this summer by my former clients Jacob and Jordana. I had helped them last year with their other dog, a Lab mix named Duke who didn’t always listen or come when they called. They had called me for help with some of Blu’s puppy behaviors; over-excitement, jumping up and being stubborn, especially when correcting him. Blu is a really happy dog who greeted me as soon as I came through the door. He was so excited that he jumped up on me repeatedly. To disagree with this behavior I applied the technique I developed specifically for jumping up. Blu didn’t like the correction but stayed true to his heritage and kept at it. I applied the technique a second time and after that, his jumping up stopped. I suggested that his owners apply the same technique consistently for the next few days. For most dogs, this is all that is needed to curb the behavior for good. After observing Blu play with Duke, I recommended that their owners stop their play any time they felt it was getting too intense. Many people mistakenly believe two make dogs cannot live together. The problem isn’t having two males, its having two males in a home with lax or loose leadership. To ensure that the dogs don’t start competing for the top spot, it will be important that their owners assume a position of leadership in both dog’s eyes. To that end I went over a leadership expertise with Blu. His owners knew the exercise from my previous session with Duke, but as it had been over a year and Blu was very stubborn, a refresher was in order. I placed a high value meat treat on the floor and claimed it as a dog would. At first Blu tried to simply bull his way through me to get the treat, so I blocked him and then used my body language and movement to tell him he needed to back away and respect a three foot boundary from the treat. It only took a couple corrections before Blu understood what I was asking and laid down to communicate he was done challenging me for the treat. As soon as he did this, I turned to the side, knelt down and tapped behind the treat to let him know he could have it. Practicing this exercise with both dogs will help Blu and Duke see their owners as being in a position of authority. This perception is crucial to ensure that the dogs don’t start to try to “one up” each other in an attempt to vie for the top spot. To further define the status of the dogs and owners, I went over a more structured feeding ritual. I had their owners put food in the dog’s bowls, but not allow them to be near or to eat their food. Once the dogs stopped trying to rush or push past them, I had their owners snack on a few chips while the dogs watched. In a pack setting, dogs eat in the order of their rank. By making the dogs wait for the humans to finish eating and then give them specific permission, we can reinforce the distinction between dog and human authority. Fortunately Blu and Duke are both good dogs who want to please. By communicating with them in a way they understand and enforcing some rules, boundary and structure, the dogs will learn to follow the lead and corrections of their owners out of respect.